In 2006 through my friend Gail Weissman I approached Studio 333 to have a fundraiser/exhibition with the artist/children that I teach at mental health agency called Lincoln Child Center in Oakland. We decided to expand the Art of Transformation to a group of like institutions in the Bay Area. My intention for this show was really to honor the children, their beauty, and their creative process.TO REALLY UNDERLINE THE POWER OF ART IN ALL OUR LIVES!! We are on our fourth year. And one of our collaborators has passed away. Jodie Matheson died way to early and way to quick. She requested at her memorial that people donate their monies to the Art of Transformation instead of flowers. I feel that Jodie really got what the Art of Transformation was about!! She in her last hour really understood the validation of this project!!! for the artists in it. The artists/children that our part of the show are marginalized, traumatized,abused, and dis empowered by the systems that have been set in place by society. Yesterday, I went to a powerful event. Ruth Klein has an amazing lecture series at Santa Monica, California Montana Branch library called “Generation Why Not®? Living a Soul-Centered & Purpose-Driven Life.” The lecture and the conversation was all about the nature of our perceptions and the illusion it creates within your Ego. At the last part of the evening Ruth did a lovely meditation on letting go of a negative perception and in that space receiving a new gift. I had a profound vision. I chose to let go of my life grid filled with the illusion of anxiety. As I did that the gift, I received a huge golden box with luscious red ribbon around. The colors were illuminating like a tibetan monks robe. In my vision I took the box within my inner chamber and placed in my Sacral Chakra area. Which is the seat of the emotional body. In that field the box seemed to melt into a diamond light. The energy was dazzling. What gift! By releasing my dreaded anxiety, I received the gift of the diamond light within my Sacral Chakra. I knew instantly that this was related to Tibetan buddhism and their practice of using the diamond light to slice away the illusion or the maya that mind creates. I joked to the group saying I was Tibetan monk in past life. This imagery was so empowering. I left the evening feeling empowered and full of light. Yes, that is what happened I metaphorically destroyed my illusion of anxiety with the thunder of clarity and inner light. 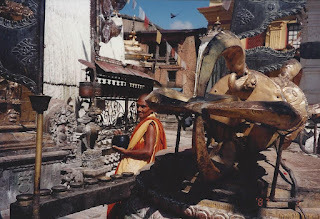 Below is photo took in Nepal with giant Vajra. 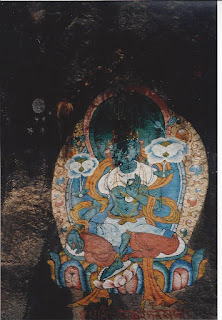 Nepal is were the Green Tara become my savior from the dire grief of losing my Mom. I am still connecting the dots 22 years later. The next amazing thing happened to me as I was walking in the diamond light. In the morning on meditative beach walk I was embracing the diamond light. I carried a crystal with me and saw the diamond light in all beings and in all things. I realized that the diamond light is the chi of life, the truest life force in all things! It is our natural way. It is the pure clear light of love and compassion. After this amazing meditation, I went and I asked my higher self to pull an archetype card from the Goddess Oracle. 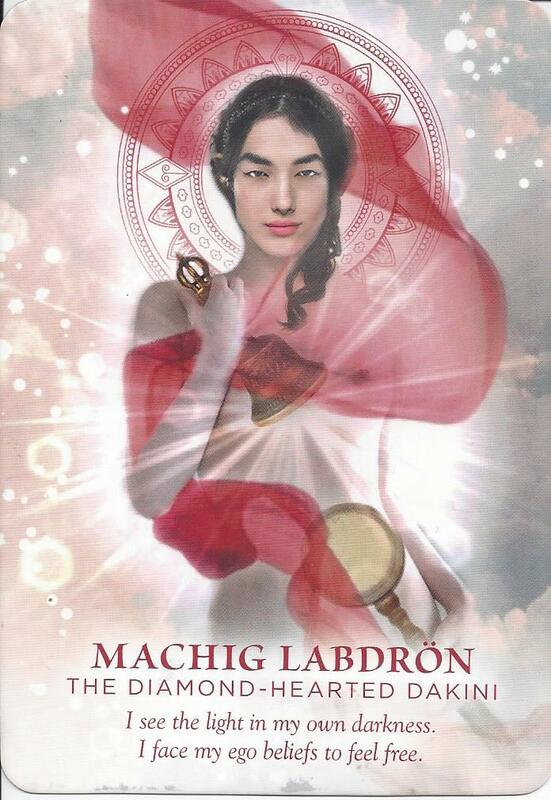 And lo and behold, I picked the card Machig Labdron, the diamond-hearted dakini. I was blown away. She is holding Vajra. As well as when I was ready this there was rare thunder happening in our Santa Monica skies. The Vijra is a symbol of a thunderous diamond. The Goddess, Machig mantra is “I face my ego beliefs to feel free.” “According to Tibetan buddhist, she is reincarnated as Lama Tsultrim Allione, an American Buddhist teacher. Alione explains in her book, Feeding Your Demons, the Chod is “a method for bringing our shadow into consciousness and accessing the treasures it holds rather than repressing it.” says Meggan Watterson in Divine Feminine Oracle Guidebook. Another crazy synchronistic thing is I just discovered Lama Tsultrim Allione and her book Wisdom Rising: Journey into the Mandala of the Empowered Feminine. In the book Allione teaches you how to embody the enlightened, fierce power of the sacred feminine—the tantric dakinis. 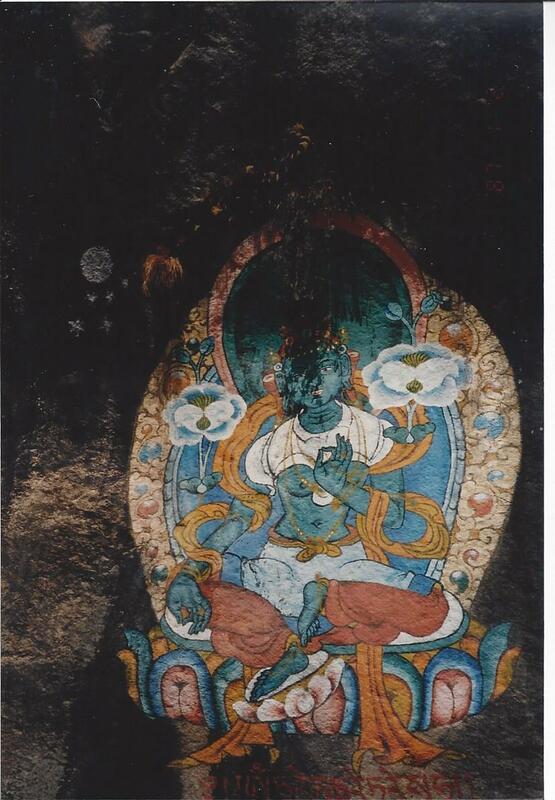 She also is aligned with the Green Tara, her Retreat center is called the Tara Mandala in Colorida. This is what Ruth precisely did in her creative visualization. She did a sort Chod, were she asked us to discard one of our negative perceptions and to receive its divine gift. True transformation happened at Ruth’s lecture. For me it has been a rich, illuminated treasure of growth and expansion of my inner diamond light. Diamond light is an in powering force of Divine alignment. It is transcendent when one walks in the field of miracles, the universe sending you signs and signals to be a light in the dark. As the - Diamond Sutra as qtd. in The Tibetan Book of Living and Dying says…. Know all things to be like this: A mirage, a cloud castle, A dream, an apparition, Without essence, but with qualities that can be seen. Know all things to be like this: As the moon in a bright sky In some clear lake reflected, Though to that lake the moon has never moved. Know all things to be like this: As a magician makes illusions Of horses, oxen, carts and other things, Nothing is as it appears. The Green Tara is a bodhisattva - an enlightened being who refuses to go to nirvana until she enlightens all souls. She is the divine Mother - the mother of all the buddhas. 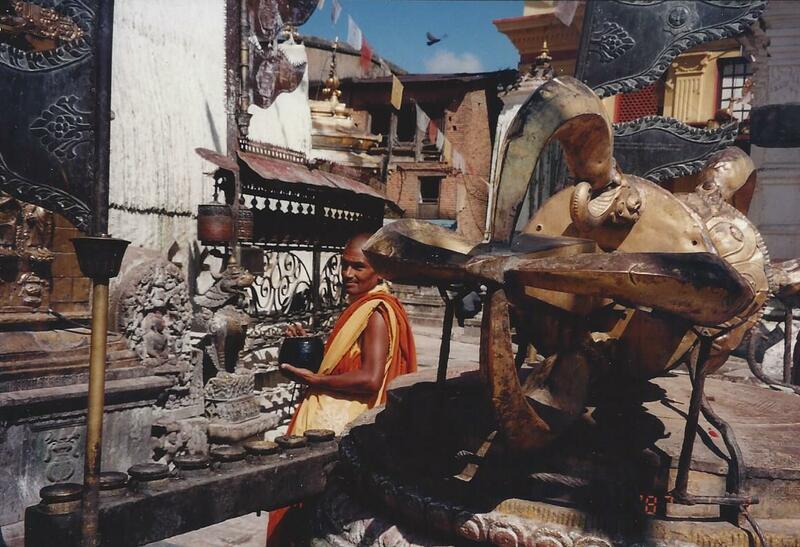 She embraced me on a pilgrimage to the Nepalese mountains. My journey to those mountains was one of healing. I had come to spread my recently deceased mother's ashes into the sacred landscape. I came with a tour group of 14 people. We hiked through the mountains each day. On the day of the most difficult climb, I fell terribly ill. I thought I was going to die. But I got through it. The next day, I felt rejuvenated. I saw the sun rise, and I embraced the beauty of the morning. I felt like I had died the night before, and that I had been reborn. I knew in my heart that this was the right day to spread my mother's ashes. After breakfast, we began hiking again. In the afternoon, as we were ascending to a monastery in the mountains, I saw a magnificent river carving its way through the landscape passionately. My eyes were drawn above it. Three hundred feet on a cliff, I saw an image of the Green Tara. I was awestruck by the shooting stars painted above her figure. For a few moments, I felt connected to the eternal. I felt my mother communicating with me, telling me that she would always be with me. On the evening I heard the shocking news of my mother's death, I stared at the sky hoping for an answer... a reason. Blazing through the Chicago night, I saw a shooting star... 'Mom'? That same evening, my older brother also saw a shooting star in the night, as he tormented over my mother's death. We both were moved to write and express this at her wake. When I saw the shooting stars above the Green Tara, I knew that I was meant to be there at that moment in time. I felt my mother's love, and the warmth of her embrace. For a few moments, I felt that I was one with the universe, and that I would never be alone. The stars and the Green Tara embraced me. I was filled with peace and a sense of letting go. I knew this place was where my mother wanted her ashes to be united with the universe. Afterwards, on a short sabbatical in the Ozarks at my family home, my passion for the Green Tara spewed from my paintbrush and my soul. She has been my guardian from the moment I saw her on the cliff. She embraces the world, and assists all who ask for her guidance. She demonstrates her magic when one is letting go... and bliss transcends.